In 2013, the Army of Poland are planning to hold field tests 40mm revolver grenade ZMT RGP-40. If the tests pass successfully, this weapon will be taken on board. The army has always been interested in personal weapons, which would provide fire support saturated with the introduction of fragmentation munitions, as the special ammunition (smoke, lighting, non-fatal) at close range. This design must have low weight and size to be worn as additional weapons fighter. In 1980 the Institute of Mechanics in Warsaw clearly developed semiautomatic Hel / Pallad S (weight 4.4 kg, with tubular magazine) and automatic grenade Pallad M/GA-1000 (weight 8.7 kg, with a box magazine), but while the military did not show any enthusiasm for them. 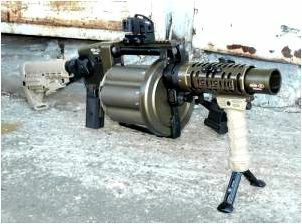 Automatic grenade launcher turret RGP-40 was designed for motivated project in 2007. Gun ammunition under 40x46SR NATO was created in collaboration designers Military Technical Academy (Wojskowej Akademii Technicznej — WAT) and the Research Center of mechanical equipment (Osrodka Badawczo-Rozwojowego Sprzetu Mechanicznego — OBRSM) in Tarnow, which is part of the plant ZMT (Zakladow Mechanicznych Tarnow) . The model was made in September 2008. In September 2009, there were two models of RGP-40. Compared with the model, they are reduced to 6.5 kg weight — iron elements changed to duralumin. Improved internal mechanisms, including gas system, remove all sharp edges. Added numbering drum cells, has also been introduced limiting the movement of the drum. In June 2010, pilot batch of 2-RGP-40 with accessories, also developed and approved for the production of documents. Visual differences between samples and standards were opytneyshemi insignificant. More important is the introduction of the rear of the housing and the barrel of a titanium alloy. Weight grenade was 6.1 kg. RGP-40 is a personal weapon for firing single shots at a range from 30 to 400 meters. Ammunition used 40x46SR NATO, differing from earliest shots 40h47 grenade wz. 1974 Pallad and wz. 1983 Pallad-D, but similar bought in 2010 grenade GPBO-40 hand grenade launchers and light GSBO-40 (family SBAO-40), developed together with the plant Dezamet. Initial velocity grenades is 76-82 m / s, but can be used grenades developed including German company Rheinmetall, at a speed of 125 m / s, which will allow to increment range of up to 750-800 meters.